Bat removal can be short-term or long-term for homeowners. Bat removal is most needed for most homeowners. Bats are the most unusual animals that can thrive in your homes. Even if you think it is quite impossible for your home to have them, you cannot discount the fact that a bat colony may have already been thriving in your home. This animal can just fly inside your home and they can hide behind your curtains or under your furniture pieces. In fact, if you find one that is hiding, you can panic even more. There is no reason to. There are certain rules to follow for that long-lasting bat exclusion that you have always wanted. Fighting a bat infestation is made possible by different Bat removal techniques. Included is what is called bat-proofing which covers a host of other repel methods ranging from the use of chemical repellents and bright lights to ultrasonic noise and Bat proofing a home. With this wide range of options, you have to be very familiar with how you can use each of them and to what extent they will be able to help you when it comes to bat exclusion. In the case of chemical repellents, for instance, you can choose from amongst the many different brands in the market. The problem you may have is they do not work long term no matter how popular this method has already been to many. In fact, if you spray them over certain surfaces where these bats hide, there is a tendency that they would encourage these bats to leave the structure but to your dismay, some others may just be left behind without you actually noticing them. Add to that, the effect of these repellents is temporary making them work only for about a month. From there, bats may come intruding once more. If you would want to get rid of the chemicals that come with repellents, another way to exclude bats in your structure is through the use of bright lights. How can this help? You may ask. Basically, in this process, what you need to do is get 150-watt bulbs to illuminate dark areas, your attics for instance. When placing bright lights on such areas, you have to make sure that the light from that bulb will be directed to popular entry points for bats. You should turn them on only after they have left their location though. This method, although successful, does not work for all instances. It is not a good bat exclusion method for huge buildings. Most pests we know love the dark. This includes the fact that they love roosting during the night most especially where they see open areas. They can live in garages, carports, behind shutters and even in building overheads. If you want them to get away from such places, you can simply make use of coarse steel wool to stuff in gaps. The best time to secure these areas is during the months of April to May. Once June and July come around it is to late as this is their baby season. These are perfect times to keep these pests from breeding. Another popular trick for bat exclusion is through the use of one-way bat doors. These doors are considered unidirectional escapes for bats and works by allowing them to leave with the opening or crack made available to them for their escape. They can help get rid of these animals from your attics, eaves and walls. The methods mentioned above have been proven to help but are not the ultimate remedies to the problem. Each of these methods has its own flaws so to speak thus making it even harder for you to make a vital bat exclusion choice. 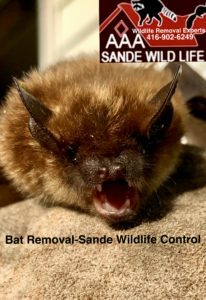 The good news is there is a sure-fire way for long-lasting bat exclusion and that is through the help of Wildlife control specialists. Wildlife control specialists make use of methods that are more effective in excluding bats and all forms of wildlife from your structure. They are gifted with knowledge to help you in ways that are long-lasting. Yes, these experts know where to start when it comes to such problems and from there, they will be able to establish the better method to help bats find their way out. In fact, they can do it in the most humane manner you would ever imagine. If long-lasting Bat removal is your goal with this infestation then there is no other better way to have it than to hire the services of experts. That way, you can be assured that all Bats will be removed from your property and will come back no more! Check out our Google Business site as well. Rodents are commonly small but they can be dangerous. They can go right inside your homes and hide themselves without you actually noticing them. When they start to populate, you will be so surprised by how much damage they have already been causing you. Often, it is not just your home or structure that is compromised but much more your own wellbeing. Yes, these pests can spread diseases that will affect your life in general. The attic is the most common breathing ground for rodents. Not only will they start bothering you there with their noises; they will also definitely cause damage to the place where they stay on. They use their small incisors to bite into just about anything and when worse turns to worst, they leave their dirt anywhere, their feces included. When rodents are there in your attic and you want to chase them away, here is what you should do. Starting to do things on your own would require careful inspection of certain things. This would also mean finding out how rodents start entering your structure and where they actually start their journey. You will be surprised to find out that they use specific entry points to start bugging into your property. You have to carefully scrutinise each entry point or suffer the threat of having rodents in your attic all your life. In order to establish these entry points even better, you can start with a list of entry points they commonly make use of. This list includes eaves and vents as well as plumbing stacks and roof joints. They can also enter through the chimney and AC chases. You will then need to look at its spot thoroughly if you want to see the better way to trap and remove them. Alongside establishing these specific visual entry points, you may also want to use the noises they make to know where they are actually hiding at. Knowing how rodents behave will help you understand the real harm they can inflict on your lives. Gnawing is a common behaviour. Leaving grease and brown stains at entry points is another. You would also notice that they leave indications on their trails thus making it easier for you to look into their ‘hideous plans’. They may have bitten or gnawed on your pipes and wires and this is something you certainly would want fixed right away. When you have already established the rodent’s common entry points, it would be good to start sealing them right away. You would not want to leave any of those entry points or lose your chance to totally get rid of them. When you have sealed all these parts, you would realise how easy it is to get rid of them. When you have sealed the entry or exit points for rodents, you can now proceed to trapping and removing them from your attic. In this regard, you are given a few choices that would work for your convenience. The first option is to use live cage traps and another is to use the so-called lethal snap traps. If you have time and you feel like doing some carpentry would be best, you can install a one-way funnel door where these rodents can take an exit. Any of these methods are considered humane enough (which can help you if you have some wildlife cause or concerns). Once you have established the perfect method for you to use, you can start setting up a trap for rodent exclusion. Remember that proper placement of these traps is most important amongst all other considerations when it comes to trapping. If you want to make sure that rodents will not infest you anytime in the near future, it would be good to clean after trapping them. Decontaminating their usual breathing grounds and deodorising these places would be a good way to prevent harm in your home and on your health and wellbeing as well. Deodorising would help keep away other rodents from coming into your attic. Remember that the pheromone scent left by your attic boarders would be a way to attract new ones to come in but once you have sanitised or deodorised the area, they will be gone for good. The tips we have mentioned above are not as easy as you think they are. They all require passion, time and effort. When you feel like you cannot do things on your own, the best way to eliminate the problem is to ask wildlife control specialists to help you. This is a sure-fire way to get rid of those pests since these experts can make use of their knowledge and tools to deal with the infestation efficiently. Using Wildlife Control Specialists Is The Best Way To Get Rid Of Skunks! Some of you might wonder why there are people who would love to have a skunk for a pet. But of course, for most of us, the natural reaction is to not have a pet skunk at all. With that second scenario in mind, it is more fitting that you rather learn how to get rid of skunks than know more about how you can actually take care of them. In this regard, we would like to let you know that contacting a wildlife control specialist is the best option you have. Here are the reasons why you should consider hiring these professionals. There are times when skunk would just love to go and roam around in any part of your home, whether your porch or sometimes even inside it. In this case, when you feel like skunks are already everywhere, the natural thing to do is to ask the help of a wildlife control specialist. You need to trap these skunks in ways that no do-it-yourself enthusiast can ever comply with. With professionals ready to lend a helping hand, you do not have to run all around your home just to get rid of those skunks. You might assume that you can just use a fishing trap or any trap in order to catch those skunks roaming inside and outside your homes. Well if you do use unsuitable traps in the endeavour, there is a great chance of danger. This is because there is a tendency you would use spray in the process and then this same spray would just spread around your place. Whilst trapping is considered one of the methods to get rid of skunks, doing it on your own instead of hiring a wildlife control specialist would not really lessen the problem. These professionals have their special traps working for this particular purpose. This includes being trained on how to handle spray just so they will only be meant to get rid of skunks and not you. As mentioned awhile back, if you choose to do the job on your own, there is a great possibility that spray would just be scattered anywhere the trap you use lands. With the help of professionals who are trained in trapping and skunk removal, there is an assurance that these chemicals and all other pieces of equipment will be handled very well with care. Skunks come with a smell that you cannot just get rid of with a deodoriser spray. When this smell is not handled well, it can go around anywhere in your home. Molecules from these odorous residues would travel in your home. This is something that should not be neglected at all. Otherwise, it will not just infiltrate all materials in your home but would also cause damage to drapes, clothing, carpet, furniture and even duct work. With professionals ready to do the job, you can be assured that the unpleasant skunk odour will be removed in no time. Professionals make use of tools that emit fragrances, deodorise and neutralise your home’s atmosphere once more. No job is hard to eliminate for them when it comes to skunk removal. Oftentimes, when you hear or see the word ‘professional’, you would presume that the entire job would cost you a lot. Professionals do come with a fee so wildlife control specialists do have that fee under their names. However, if you try to analyse things, you will realise that there is much you will save when comparing such fees with the fees you will incur if you decide to do things on your own. Professionals charge you by the job they do and since they are experts in their chosen field, you can be sure they will eliminate the problem the very first time you hire them. In the long run, they will save you on skunk spray costs knowing that they can deal with that odour problem using the spray that is recommended for doing away with the smell. They do not have to re-spray your home just to get those filthy smells out. They go down to the root of the problem and eliminate all possibilities of an offspring hiding under your sheets which you may have left unnoticed if you do things on your own. Of course, you may consider rehiring them in the future just to be sure those pests will not bother you any longer. Skunks are an annoying type of pests and you should not allow them to run amok in your property. When you want them out of your homes, the best thing to eliminate them is to ask the help of a wildlife control specialist.